The blood of John Paul II is honored as his chief relic. Today is the anniversary of momentous events in the history of the twentieth century. It is the 99th anniversary of the first appearance of the Blessed Virgin Mary to the shepherd children at Fatima. In the ensuing months these three small children were given a mysterious glimpse of the drama and the horror that awaited the Christian people and the whole world in the years to come. 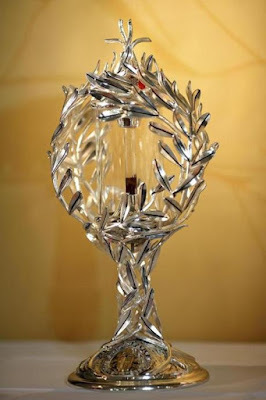 The Virgin Mary also reaffirmed her special closeness to the Popes, whom, she said, "would have much to suffer." Thirty five years ago, on May 13, 1981, that suffering reached a climactic moment that touched all of us. Thirty five years ago today, Saint John Paul II shed his blood for Jesus Christ and His Catholic Church. In the early history of Christianity, people who endured persecution for Christ, who were afflicted with the wounds of torture and imprisonment but not put to death, were styled "Confessors." Sometimes they returned to their communities, where their ongoing witness encouraged others in difficult times. John Paul II's body was pierced through by the bullet of a professional assassin from Turkey, Mehmet Ali Agca. It was the perfect execution of an operation that had been planned for months by various criminal organizations headed, allegedly, by agents of the Bulgarian secret service. It is likely that Bulgarian agents were carrying out orders from the Soviet Union. John Paul's 1979 visit to his native Poland had shaken the foundations of the totalitarian atheistic Communist system. His witness to the faith and to the dignity of the human person lit a fire in the hearts of the Polish people, a fire that grew bright the following year in the rise of the independent trade union Solidarity. The Soviets and their minions had "motive," certainly, to desire to be rid of this meddlesome priest. They had plenty of opportunity to access the young Pope who was so accessible to the people everywhere he went. It would not have been difficult for them to arrange the hire of a professional gunman with obscure connections and set in motion a plan to kill the Pope. In fact, the Agca plan was a success by every standard of human evaluation. He was able to fire a perfect shot at close range. 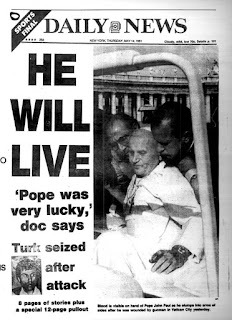 But there remained one inexplicable fact: John Paul II didn't die. Miraculously, the bullet did not pass through any major organs, though it did significant damage to his intestines. The Pope underwent hours of surgery as the faithful and people of all religions and viewpoints prayed and hoped and worried desperately. He survived. He would later insist that "one hand pulled the trigger, but another hand guided the bullet." He was convinced that the Mother of God had protected him and saved him on that day. He had shed his blood in the exercise of his office as successor of Saint Peter. But he remained with us for almost 24 more years. They were years of eloquent witness, years that gave us courage.